Explore Alaska and the Arctic Far North with Ponant. More than just journeys, the promise of exceptional destinations and encounters in other worlds that include Greenland, Iceland, Spitzbergen, the Baffin Sea, the Northwest Passage and Alaska. Follow in the footsteps of pioneers and adventurers who tried to tame this wild land. Carefully crafted itineraries reveal secret expanses of Alaska where nature carves a world of vast glaciers, turquoise waters, lush forests and snow capped peaks. Further north, venture across the Arctic Circle to regions famous for polar bears, icy landscapes and dormant volcanoes. Cruise on ice-rated luxury expedition ships equipped with a fleet of Zodiacs that allow Ponant to explore where large cruise ships simply cannot reach, getting close to nature, guest experiences enhanced with expeditions ashore. Join with the expedition team to meander through ice flows, wonder at vertiginous fjords and explore the vastness of this pristine polar seascape. Itineraries during 2015 reveal 7 remote lands and the opportunity of interaction with 5 ethnic groups - ancient communities, including the Inuit and American Indian tribes such as the Tlingit. Travel with Ponant, the polar and ice specialists, on board modern eco-friendly sister ships, L’Austral, Le Boreal and Le Soleal, part of the youngest fleet of luxury and expedition ships in the world. A specialist expedition team, guides and lecturers including, typically, naturalists and geologists, enhance your voyage experience. From Iceland to Baffin Bay, Siberia, the Northwest Passage and the Russian Far East, enjoy unique 5 star experiences onboard and ashore, and expeditions that include the most beautiful nature reserves in Alaska, UNESCO World Heritage sites, geysers, lava fields and volcanoes. Adventure in the lands of the majestic polar, brown and black bears, humpback and minke whales, bald eagles, caribou, orca, Arctic Fox and Narwhal, and visit whaling stations and Russian trappers cabins ….. join the Gold Rush. 95% of all accommodation features a private balcony, perfect for observing nature at her majestic best, perhaps including the spectacular lights of aurora borealis. 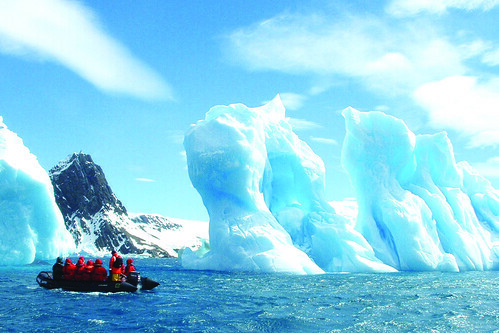 Enjoy polar landscapes and wildlife by day, back on board relax with a glass of champagne or a swim in the heated pool. Experience counts. With over 15 seasons of polar experience, 12 in the Far North, Ponant has built its reputation as a true specialist, sailing in extreme environments. An Open Bridge policy offers guests insight into the specialist workings of ice navigation in these extreme regions. Flexibility is key, with the Captain able to adapt the daily itinerary to maximise opportunities, such a adjusting course in order to allow guests to watch a nearby pod of whales or photograph a polar bear on an ice flow. Add to the adventure by selecting from an extensive range of optional shore excursions, including flight-seeing the Misty Fjords by seaplane, or flying into the famed Valley of the Geysers in Kamchatka by helicopter. In Alaska, the Rocky Mountaineer train trip is an unforgettable pre or post voyage option not to be missed. Ponant balances extremes of nature with warmth, comfort and exceptional service onboard - all with a dash of French panache. Alaska: Vancouver to Juneau or v.v. on L’Austral (5 voyages during June/July 2015 (7 nights) are available from A$4,270. A limited number of 0% single supplements are still available. Northwest Passage: Kangerlussuaq to Anadyr on Le Soleal / August 24 2015 (22 nights) from A$25,955. Includes connecting flights from Paris to Kangerlussuaq and Anadyr to Tokyo plus one night accommodation in Tokyo. Russian Far East: Anadyr to Petropavlovsk on Le Soleal / 15 September 2015 (14 nights) from A$11,430. Includes connecting flights to/from Tokyo to Anadyr and Petropavlovsk plus accommodation for one night in Tokyo pre and post voyage. Eastern Siberia and Kodiak Peninsula: Pevek to Seward on L’Austral / 19 August 2015 (11 nights) from A$8,990. Includes one way flight Tokyo - Pevek plus one night accommodation in Tokyo. Additional information and reservations can be made by phoning (in Australia)1300 737 178 or + 61 2 8459 5000, (in New Zealand) 0800 44 32 62, email reservations.aus@ponant.com or contact your travel agent.